That afternoon the hot sun complemented the crowded highway leading towards Bandung. Fatwa and Bagas rode their motorbikes looking for loopholes to overtake vehicles that stopped because of the traffic jam. While Gabbi and I focused on looking at our mobile screen to tell directions. Shortly afterwards, the traffic jam turned into endless slopes and descent. I checked my phone again, evidently it was still 20 minutes to reach the destination. Slowly Fatwa’s motorbike in the back approached Bagas’s. "Look at the message from Mr. Didit in the group chat," Fatwa said. I opened it, there was a map picture showing the location of Mr. Didit. We continued the journey and passed several natural tourist attractions, one of which was the famous Lodge Maribaya. A row of vegetable gardens began to appear, filling the right and left side of the road. Finally, we arrived at the Cibodas village’s head office. I opened the helmet, my jilbab was out of shape, while Gabbi also complained about her hair condition. Mr. Didit and Mr. Agus were seen talking to local residents. Mr. Didit approached us and said that the village’s head and his staff were on holiday every weekend. When we heard that, we felt sad because we couldn’t get the chance to do interview. But we didn’t leave immediately. Mr. Didit suggested us strolling around while he waited there, if there were other staff who might come. When we found a canteen, we were surprised to see two men in orange jackets there. Seeing his fellow faculty members, Fatwa immediately approached them. After a brief conversation, it was known that they were 2015 students and they also have a project with Mr. Didit. Suddenly Fatwa’s cellphone rang. He received it, then told us that Mr. Didit asked us to return to the village head’s office. When we came back, Mr. Didit introduced us to Mr. Riana. From so many information we got from Mr. Riana about Cibodas Village, we were interested in interviewing successful farmer named Mr. Dedi. Before we went to find Mr. Dedi’s house, we exchanged handshake and said thank you to Mr. Riana and our lecturers. 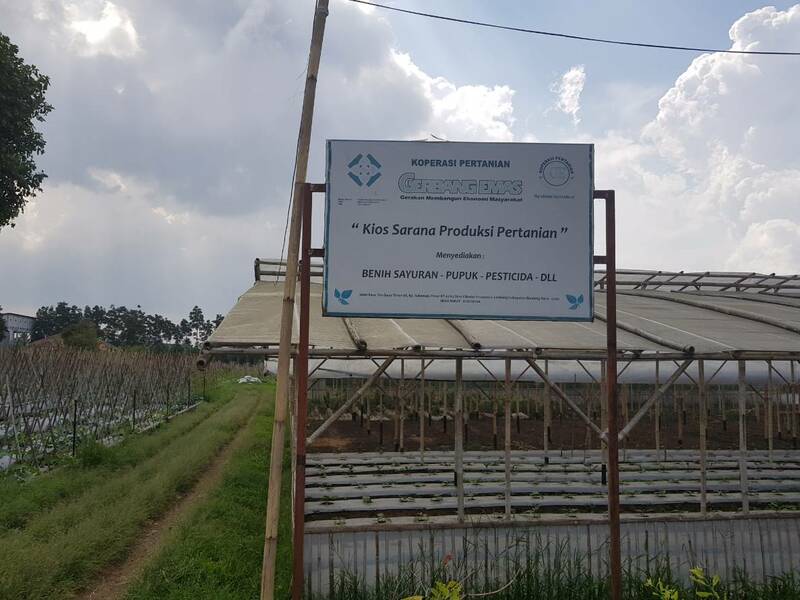 After asking the local residents, we arrived at a simple little house that has a tag "Gerbang Emas Agricultural Cooperative" which stands for "Gerbang Membangun Ekonomi Masyarakat". The green leafy vegetables were seen around the house, some are covered with roofs and some are directly exposed to the sun. We stepped toward the door and Fatwa hesitantly opened it. "Excuse me, sir, we came here to meet with Mr. Dedi Hermawan. Is he there?" Fatwa said. I looked from the outside of the door, shortly afterwards Fatwa went inside. I and the others followed him. We were shaking hands and after introducing ourselves, Gabbi began to open a conversation. "Before coming here we were from the village’s head office, sir, there we met Mr. Riana." Gabbi said. "Yes sir. Previously we wanted to do disaster mitigation about landslides, but from a geological map, it is not possible because Cibodas is a green area. The possibility of a disaster come from a Lembang Fault such as an earthquake. Therefore we try to figure out another field, which is agriculture." Fatwa said. Gabbi said, "Earlier I read the profile of Cibodas Village. It is said that there are hydroponics and aeroponics -"
"No, we didn’t have Aeroponics yet." Mr. Dedi said. "Oh, I’m sorry," Gabbi said, "Mr. Riana then told us that we could ask about agriculture to Mr. Dedi." "Sure, I don’t mind. But if possible, just give me multiple choice A, B, or C, so I could answer easily." said Mr. Dedi with his relaxed face. "If we may know, what are the main commodities of your farm, sir?" Gabbi said. "The vegetables are … That, Jan."
Mr. Dedi turned to the man named Ojan. Ojan and his friends chuckled. "Please just ask, I’m also an intern. Are you guys from Unpad?" "Yes, brother. Where are you from?" Fatwa said. "I’m from ITB, I have graduated but still have a student spirit," Ojan said, chuckling. "What are the problems that farmers in here facing, brother?" Gabbi asked. "There are many; digestive problems, pesticides, pests, low selling prices," Ojan said. Mr. Dedi begin to tell the village’s history, he said that Cibodas Village is entering a transition period. It is not really a village, but if we call it a city it is still far away. The problem of agriculture here in the past 2 years is, Cibodas lost almost 14% of land to become tourist attractions. Cibodas itself from the 2000s has been planned to be a tourist village. “But a tourist village that seems like a magic thing. Simsalabim! Because the head’s village didn’t have a proper plan. We cannot achieve the goal if the construction is not directed there." "In 2007 Cibodas Village was declared by the Minister of Agriculture Mr. Anton as the campus village of the national farmers. Cibodas is one of the villages where the interns and comparative studies are located. I don’t think the village head is burdened but we feel burdened, actually. Tourist villages or campuses for farmers, but we don’t upgrade the farmers? We really need to develop many components: human resources, natural resources, new technological innovations, government regulations. Who said there is no potential landslide here? There is in Maribaya not long ago." Mr. Dedi said. "From what I’ve seen in geological map, Cibodas is green, but the green part is only two fingers. The rest is purple, purple is prone to landslides but not so big." Fatwa said. "So, for now you guys just collecting data, right?" Ojan said. "For me, I like to waste my data." Mr. Dedi said, "My mobile data." Ojan and his friends laughed. "You have to be patient. It’s been a year for me." Ojan said. The other said, "I also didn’t understand at first." "You said before, that you want to focus on agriculture. What do you mean?" Mr. Dedi said. "I think it is like, there are vegetable products that people buy most often here. Then we processed the products to be something new, strange, and useful." "Like vegetable juice? Is that weird?" "I don’t think that’s weird, if he is a vegetarian, sir. Maybe something like vegetable chips?" "I think another problem is about the unstable price," Ojan’s friend said all of a sudden. "The problem of supply-demand is troublesome. It’s different from China. The government will prepare the land first, this is for a vegetable area, this is a fruit area, etc. But in Indonesia the farmer thinks this is my lands, my capital, it’s up to me then. If we want to plant something in China, it’s like a waiting list. When the quota is full, we should wait until the next period. As a result, the production becomes stable, as well as the selling price." Mr. Dedi said. "What we have done is sign a contract before planting, like with Pizza Hut in Bandung. It’s been 5 years to become a single supplier for 4 commodities: tomatoes, paprika, lettuce, bean. I myself have a mission here to make younger generation interested in agribusiness. Gabbi is in the agriculture department, right? Do you feel trapped? I think there is no student whose main intention is to become a farmer. Even the average children want to be a doctor, a pilot, or a president. Is that right, Gabbi? It’s okay, just admit it." Ojan and his friends laughed. Gabbi just smiled. "How many generations of Unpad students have come here, sir?" "Ah, I didn’t count it. Every year there are those from agribusiness and agrotechnology." Then the door was opened, revealing a woman. She smiled at Mr. Dedi and us. After that, she sat near Ojan. "Well, she is from the agriculture department too. But all her friends here are actually different." "Yeah. She is from business and management, he is from physical engineering, and I am from electrical engineering," Ojan said. “Well, do you want me to give you homework? Try to make agriculture looks cool to the young generation." Ojan’s friend agreed, "Yes, regeneration problem." "Don’t forget to follow maremain.id instagram too." Ojan said. "If it’s been done, then how will the general public increase their awareness of eating vegetables." Mr. Dedi said. "What will the output plan be?" "Now it’s still a PKM proposal, sister." “Yes, I am.” Bagas said. Bagas nodded. I also felt that’s a good idea. When we began to find the ideas for making proposal, suddenly Bagas’s cellphone rang. Not long after that, Bagas told us that Mr. Didit invited us to eat together. Fatwa, as our leader, tried to close the conversation. Then we shook hands and thanked Mr. Dedi, Ojan, and his friends for their kindness to accept our sudden arrival. Photo by Rizaldy Bagas P.